In the Bible, it was Noah who stuffed the animals into the ark, two by two. Now there is Russell Crowe, whose movie “Noah” went on general release this weekend, and whose animals are almost the backstory compared to Noah's family disputes. But from 1958-64, on the Zambezi River and in the Zambezi valley between Zimbabwe and Zambia, there was another Noah: a game warden for the colonial government in Southern Rhodesia, who was the nearest thing to the biblical Noah. He led a small band of ingenious men, who between them saved about 6,000 creatures, great and small, from a watery grave. The man who mounted probably the greatest animal rescue since the captain of the vessel in Genesis was Rupert Fothergill. This quiet “man of the bush” was in his forties when he undertook the rescue of every kind of living creature trapped by rising waters from the giant Kariba hydroelectric dam project, which flooded the Zambezi valley downstream from Victoria Falls. At the time, the waters behind the dam created the largest man-made lake in the world. Because the governments of the British colony of Southern Rhodesia and and the British Protectorate of Northern Rhodesia were primarily concerned with relocating about 57,000 Tonga people from the flood plain, little attention was paid to the density of game that would be drowned. Enter Fothergill, who orchestrated “Operation Noah.” With few resources, and often no idea how to do it, Fothergill and team went to work, learning as they went along. As Tim Abbott, an American conservationist, told me, “How do you tranquilize a black rhino?” Well on YouTube, you can watch some amazing footage of the enormous, beautiful beast being secured, fighting back and finally being tied to a giant stretcher that was dragged onto a raft made of oil drums for the journey to her new life on high ground. As the waters of Lake Kariba rose, islands formed in the flood plain, trapping everything. There is a searing image, recorded in a blog by Abbott, of a giant bull elephant, found by Fothergill's team when it was near death, having swum for five hours, its trunk changing color from the exertion. Some big game was more or less ridden to safety through the rising water. Small creatures were carried in loving arms onto small boats and taken to safety. 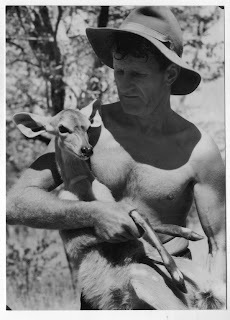 There are photographs and there is 16mm film of the rescues, even of Fothergill pampering an antelope calf. Peter Jones, now 77 and living in Durban, South Africa, was on Fothergill's team. He told me by phone that gradually and with very few resources, they leaned how to save everything from poisonous snakes to the big game — buffaloes, elephants and rhinos; the big antelopes, eland, kudu, sable and wildebeest; cheetahs, leopards and lions; and hyenas. Fothergill and his men (about seven white Rhodesians and 50 Africans, Jones recalls) had a small flotilla of dinghies with Evinrude outboard motors. There were six or seven of these, but later a larger boat (Jones thinks it was 30- or 35-feet-long and fitted with a diesel engine) was procured and used to tow the other boats with men sitting in them, holding animals in bags and nets and sometimes just in their hands. The boat's name was “The Tuna,” and it had come overland from South Africa — boats were in very short supply in that part of Southern Africa, a largely arid area. I missed “Operation Noah” by a year. When I was a young reporter (17 years old), I was sent to the Kariba dam site to cover floods that threatened to wash the whole project away. It was just a year before the great animal rescue began but my boss, Eric Robins, a man from whom I learned my trade, was aware of the coming wildlife tragedy. Later, he wrote a book about it called “Animal Dunkirk: The story of Lake Kariba and 'Operation Noah,' greatest animal rescue since the Ark.” It was. It was. Sadly, “Operation Noah” got lost in the turbulent history of Africa that was to follow and particularly the civil war in Rhodesia, which brought an end to the colonial era and tended to inter its good deeds with the race issues that dominated the politics.